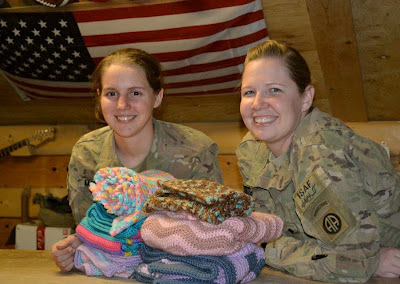 Late one night back in January, I was cruising the crochet blogosphere and happened across a blog by a young woman named Jenn serving in the Army over in Afghanistan. She had recently learned to crochet and was really excited about sharing her yarny adventures, especially with the friends and family she was missing back home. Reading through her blog I saw that she was looking for a charity to crochet for and having trouble getting yarn in Afghanistan. She mentioned that she liked working with Caron's Simply Soft, and I had a TON of extra Simply Soft I had purchased last year for my first Crochet Along which I did not end up using. I was in the midst of writing my first patterns for publication, crocheting samples, and preparing many more submissions, so I knew I would not have as much time to crochet blankets this year to donate near my daughter Rowan's birthday in August, as I have every year since she was born. On a whim, I emailed this young soldier, and offered to send her some yarn if she wanted to crochet a few blankets for my project. I ended up shipping her 13lbs of yarn, including some I thought she might enjoy for own projects. When she responded to my email she let me know that her friend Laura also wanted to make blankets. Jenn started a project on her own blog she calls "Blankets for Babies" to encourage others to make blankets for babies who have to stay in a NICU. They also found out they would be able to receive a service medal for doing volunteer work during their deployment! I included a letter to their Sergeant with the package of yarn about the volunteer work they were doing for my project. Last week I received a package from them including 7 finished blankets and 2 little hats made while they are serving our country overseas. She warned me I would need to wash them, as the dust and sand gets into everything. But I am so excited to have them and will be displaying them at my town's Quilt and Fiber Arts Festival before I donate them. We will also be collecting 9" squares and finished blankets for the Remembering Rowan Project, so have more blankets to donate. Thanks so much to Jenn and Laura for making sure I have something to donate in honor of Rowan's Birthday this year! Another one of Jenn's crochet projects has inspired my next collection for the Remembering Rowan Project, Scarves and Comfort Monsters for local Foster Kids! Her first little monsters are so cute, but very easy with just single crochets, and no increases or decreases, a great beginner project. I think they will be the perfect thing to cuddle for kids who often have to leave their homes without anything except the clothes on their backs. This is such an awesome story! And I love those little monsters. Can't wait to try to make some of my own to donate for the cause. I'm not surprised that soldiers would so selflessly give to a worthy cause because every one of their days they are giving selflessly of themselves as they serve. I think it's wonderful that they will be recognized for their volunteer service. I hope the crocheting helped make their days a bit brighter as their afghans helped to brighten the day of someone else.